Hank and Nick suspect wesen of being involved in the death of a woman who seems to have aged 70 years overnight; the duo turns to Rosalee for help in the investigation. Also, Eve turning herself into a Renard replica was super gross. Yeah, that was a really slow-moving episode. I don't think I've ever seen them take so long to get to the case-of-the-week murder; that entire scene in the make-up store would normally have been taken care of in expository dialogue during the photo-shoot or by the roommate during the investigation. At first I thought they were maybe setting up a plot twist where the photographer turned out to be the victim-of-the-week, but, no, they really did just take 15 minutes to get to what would usually be done in the teaser. Eve's head on Renard's body was so goofy. I guess they were going for some kind of "who is she mimicking?" suspense, but, they've given Sasha Roiz so many shirtless scenes over the seasons there was no question whose torso that was. (I am forever amused that he's even shirtless in the opening credits now; like, just in case the writers can't figure out a reason to get his shirt off within the episode, it's always there.) Anyway, it gave me a laugh. It seems like they're setting up some maybe-she's-not-permanently-Eve-after-all junk and I am just over that. It would be more interesting to just move forward with her as a whole new (familiar looking) character, though perhaps this is aiming at some symmetry with Adalind. The thing is, if they're going to keep her as Eve forever, well, they need to make Eve into an actual character, rather than just an android. 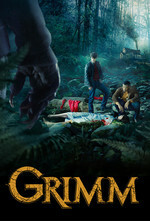 Grimm is renewed for season 6. I dunno, I thought it was kind of a fun schlocky body-horror episode. The doc's face at the end was pure B movie. The "Renard runs for Mayor" plot is just draaaaaaaaaaaaaaaging, though. And if I see someone remembering Red on the phone glancing up at the assassin one more time . . . .